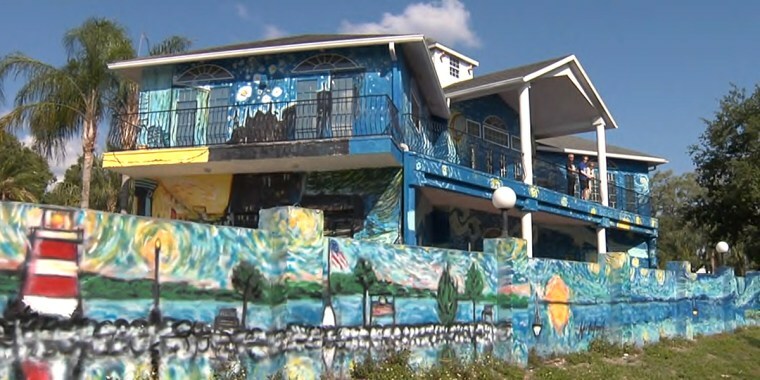 A Mount Dora, Florida, couple had their house painted to look like the Van Gogh masterpiece to help their adult son, who has autism. There's a blue house in central Florida that's hard to miss. It's somewhat famous among people who live nearby — it's painted to look like "Starry Night," the iconic painting by Vincent van Gogh — but not everyone is a fan of the larger-than-life artwork. For the past several months, the couple who own the home have been in a messy battle with the city of Mount Dora, Florida, over the unique paint job. "We had not originally intended to paint the house like this," Nancy Nemhauser, who lives there with her husband, Lubomir Jastrzebski, and their adult son, told TODAY. They started by painting the wall that runs outside of their home, because it was "in disrepair" and they wanted it to look nice. The couple said they even asked permission from the city to paint the wall, and were told it was OK.
"So we went ahead and started having the wall painted by an artist who has his work shown throughout South America," Nemhauser said. They chose Van Gogh because their son, who has autism, is a fan — and they hoped that the mural would come in handy if he ever wandered far from home. "God forbid he were to be in a situation where he did not have the ability to articulate his address, we're hoping that he would have the ability to at least say that he belongs at the Van Gogh house," Nemhauser said. The couple added that their son loves the look of the house. "There's some magical connection I think between Van Gogh and autistic kids, because Van Gogh was possibly also autistic," Jastrzebski said. After they painted the wall, Nemhauser and Jastrzebski said they got a citation from the city stating that the wall painting was considered graffiti, and that the wall must match the house. That's when they decided to paint the entire house to look like "Starry Night" — knowing that's not quite what the city had in mind, but confident that they weren't breaking any law. Since then, they've been fined $10,600. In February, they filed a federal lawsuit against the city, claiming the city is violating their right to freedom of expression. Mount Dora city officials nor their attorney would comment to TODAY. But in February, they did say in a statement that they're trying to "preserve the residential character of our neighborhoods," and that the house "may present a distraction to safe vehicle operation along the street which fronts the home." While both sides are in settlement talks, the fate of the mural is still up in the air. The family said they're ready to battle for what they believe in. "I'm willing to fight to the bitter end and I understand we could lose the house," Jastrzebski said. The reaction to the mural has been mixed by neighbors. "I think it's fantastic, " resident Ilka Zuijderland-Varnes told Kerry Sanders on TODAY Tuesday. "I think it's art, and we're an artsy town, and it should stay." "Aesthetically, no,'' resident Tammy Swan Bacon told Sanders about whether she liked it. Bacon noted that even though she is not a fan of the home, she thinks city officials should leave the family alone. Nemhauser and Jastrzebski add that many neighbors love the house, and thousands of people have signed an online petition in support of keeping the painting. "This is an artist community," Jastrzebski said. "And initially when we painted the wall, we thought, this is a gift to our artsy town. Because this is beautiful."